Good morning! 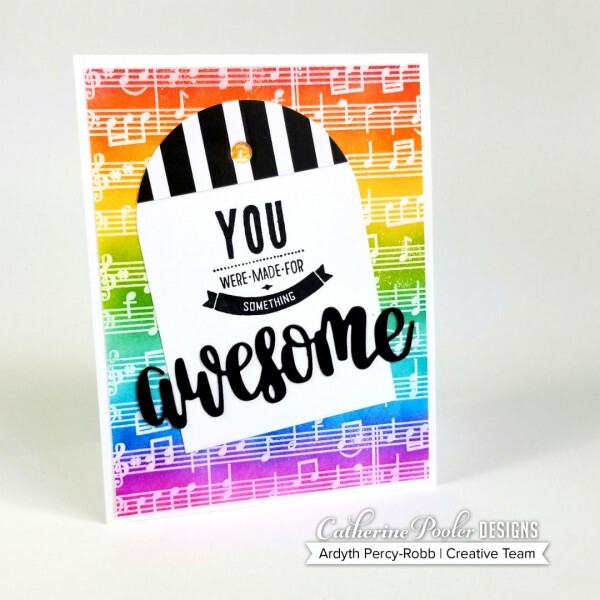 Ardyth here with a vibrant, happy rainbow card using some of the products from the All That Jazz release, as well as products from the Counting Blessings Stamp of Approval Collection- all are available in the shop for individual purchase. I started by embossing the new Music background in white on a white panel, then I used sponge daubers to apply ink in rainbow order to each line of music, making sure that each colour blended with the next, by overlapping them a little bit. I rubbed the embossing with a dry paper towel to make sure that there was no ink left on the white music and then I trimmed this panel to 4×5.5 to fit on my white card base. I cut the large tag from white card stock for my sentiment panel and created a dramatic topper with one of the patterned papers from the Black Tie Gala paper pack. I did this by placing the tag die on the edge of the patterned paper and centering the hole of the tag on the paper, so that both edges would end in the black stripes. I adhered this topper to the tag with glue tape. I masked and stamped a sentiment from Good Things, and substituted a bold, black die cut Awesome, allowing the edges of the word to overhang the tag.